Regulation of rod gene expression has emerged as a potential therapeutic strategy to treat retinal degenerative diseases like retinitis pigmentosa (RP). We previously reported on a small molecule modulator of the rod transcription factor Nr2e3, Photoregulin1 (PR1), that regulates the expression of photoreceptor-specific genes. Although PR1 slows the progression of retinal degeneration in models of RP in vitro, in vivo analyses were not possible with PR1. We now report a structurally unrelated compound, Photoregulin3 (PR3) that also inhibits rod photoreceptor gene expression, potentially though Nr2e3 modulation. To determine the effectiveness of PR3 as a potential therapy for RP, we treated RhoP23H mice with PR3 and assessed retinal structure and function. PR3-treated RhoP23H mice showed significant structural and functional photoreceptor rescue compared with vehicle-treated littermate control mice. These results provide further support that pharmacological modulation of rod gene expression provides a potential strategy for the treatment of RP. There are several diseases that cause people to lose their eyesight and become blind. One of these diseases, called retinitis pigmentosa, kills cells at the back of the eye known as rod cells. At first, it affects vision in low light and peripheral vision, but later it affects vision during the daytime as well. There are no effective treatments for patients with retinitis pigmentosa. Yet previous genetic studies have shown that disrupting the activity of genes in rod cells can slow the progression of the disease and preserve vision in mice. As for all genes, proteins called transcription factors regulate the activity of rod cell genes. Nakamura et al. now report the discovery of a small drug-like molecule, that they name Photoregulin3, which alters the activity of a transcription factor that regulates rod genes. In follow-up experiments, mice with a mutation that replicates many of the features of retinitis pigmentosa were given Photoregulin3 to see if it could slow the progression of the disease. Indeed, Photoregulin3 could stop many of the rod cells from degenerating in the treated mice. At the end of the experiment, the mice treated with this small molecule had about twice as many rods as the control mice. The treated mice also responded better to flashes of light. Nakamura et al. hope that the findings will one day benefit patients with retinitis pigmentosa. But first more research needs to be done before testing Photoregulin3 in humans. For example, the drug-like molecule needs to be made more potent, and if possible adapted to work when given orally, meaning patients could take it as a pill. Retinitis pigmentosa (RP) is an inherited retinal degenerative disease with a prevalence of 1 to 3,000-5,000 births (Hartong et al., 2006; Parmeggiani, 2011; Boughman et al., 1980). More than 3,000 mutations in about 60 genes have been identified to be associated with RP (Hartong et al., 2006; Daiger et al., 2013). Most of these mutations are in genes essential for rod photoreceptor development and function (Hartong et al., 2006). There is currently no approved medical therapy that slows or prevents rod degeneration in these individuals. One emerging approach to treating retinal degeneration is through targeting the factors that regulate rod gene expression. Studies of retinal development have identified several transcription factors that regulate photoreceptor gene expression. For example, loss of function mutations in the rod-specific transcription factors Nrl or Nr2e3 cause rods to acquire a more cone-like identity (Mears et al., 2001; Montana et al., 2013; Haider et al., 2006; Haider et al., 2000; Cheng et al., 2011; Cheng et al., 2004; Corbo and Cepko, 2005; Peng et al., 2005; Chen et al., 2005; Zhu et al., 2017; Yu et al., 2017). Knockout/down strategies have shown that Nrl and Nr2e3 are necessary even in mature rods to maintain their normal levels of gene expression (Montana et al., 2013; Zhu et al., 2017; Yu et al., 2017). Moreover, the reductions in rod gene expression from deletion of Nrl or Nr2e3, with either conditional deletion or CRISPR-Cas9 deletion, were sufficient to promote the survival of photoreceptors in multiple models of recessive and dominant RP (Montana et al., 2013; Zhu et al., 2017; Yu et al., 2017). We have recently reported that this regulatory pathway can be modulated using small molecule modulators of rod gene expression that we have named Photoregulins (Nakamura et al., 2016). Treatment of developing or mature retina with Photoregulin1 (PR1) reduces rod gene expression and increases the expression of some cone genes. In addition, treatment of two mouse models of RP (mice with the RhoP23H and the Pde6bRd1 mutations) with PR1 slows rod degeneration in vitro (Nakamura et al., 2016). However, in vivo analyses of PR1 were limited by the compound's potency, solubility, and stability in vivo. In this study, we have identified a structurally unrelated compound, Photoregulin3 (PR3) that also significantly represses rod gene expression, but is more amenable for in vivo studies. With PR3 treatment, we show anatomical and functional preservation of the retina in RhoP23H mice, providing in vivo proof-of-concept of this novel therapeutic strategy for the treatment of RP. In order to identify compounds that may target Nr2e3, we searched PubChem (https://pubchem.ncbi.nlm.nih.gov/) for top-scoring hit compounds previously identified to interact with Nr2e3 in transfected CHO-S cells in a luciferase-based assay (PubChem Assay IDs: 602229, 624378, 624394, and 651849). As a secondary screen for the initial hits we used primary retinal cell cultures and assayed Rhodopsin expression because it is a well-defined target of Nr2e3 signaling and is expressed at high levels exclusively in rod photoreceptors (Cheng et al., 2004; Peng et al., 2005; Haider et al., 2009). We dissociated retina from postnatal day 5 (P5) mice and cultured them in media containing the small molecules. After treatment for 2 days, we assessed Rhodopsin expression with an immunofluorescence-based assay (Nakamura et al., 2016). One compound, PR3 (Figure 1A), showed robust reduction in Rhodopsin compared to DMSO and PR1 treatment (Figure 1B). We confirmed this finding with qPCR analysis using intact retinal explant cultures from P4 mice treated with a 0.3 μM dose of PR1 or PR3. Similar to the immunofluorescence assay, treatment with PR3 resulted in reduced Rhodopsin but not Otx2, a rod transcription factor upstream of Nr2e3, compared to DMSO and PR1 (Figure 1C). PR3 reduces rod gene expression via Nr2e3. (A) Chemical structure of Photoregulin3 (PR3). (B) Dose-response relationship of PR1 and PR3 on Rhodopsin expression in dissociated retinal cell cultures (n = 3 for each concentration for each compound; value graphed is the mean ±SEM of 3 biological replicates). Example scans of Rhodopsin and ToPro3 staining from retinal cell cultures are shown on the right. (C) Confirmation of PR3’s potency by qPCR from intact retinal explant cultures from P4 mice treated with DMSO or 0.3 μM PR1 or PR3 for 2 days (n = 3–4 for each compound; value graphed is the mean ±SEM of the biological replicates, *p=0.0075 for DMSO vs. PR3, two-tailed t-test assuming equal variance using ΔCT values). (D) Intact retinas from P11 mice were explanted in media containing DMSO or 0.3 μM PR3 for 3 DIV and then stained for S Opsin in a whole-mount preparation. Scale bar represents 50 μm. (E) PR3-treated retinas had more S Opsin+ cells per 100 μm x 100 μm field in the ventral, but not dorsal, retina compared to DMSO-treated retinas (n = 3 biological replicates; value graphed is the mean ±SEM of the biological replicates, *p=0.00063, two-tailed t-test assuming equal variance). (F) Isothermal titration calorimetric study of PR3 binding to Nr2e3. (G) Intact retinas from adult (P23–P35) wild type and Rd7 were explanted in media containing DMSO or 1 μM PR3 for 2 days and Rhodopsin expression was measured by qPCR. PR3 decreased Rhodopsin in wild type retinas but not in Rd7 retinas (n = 4 biological replicates; value graphed is the mean ±SEM of the biological replicates, *p=0.033, two-tailed t-test assuming equal variance for wild type and p=0.13, two-tailed t-test assuming equal variance for Rd7 using ΔCT values). Mutations in Nr2e3 result in an increased number of S Opsin+ photoreceptors as well as a reduction in rod gene expression (Haider et al., 2006; Haider et al., 2000; Cheng et al., 2011; Peng et al., 2005; Chen et al., 2005; Cheng et al., 2006). 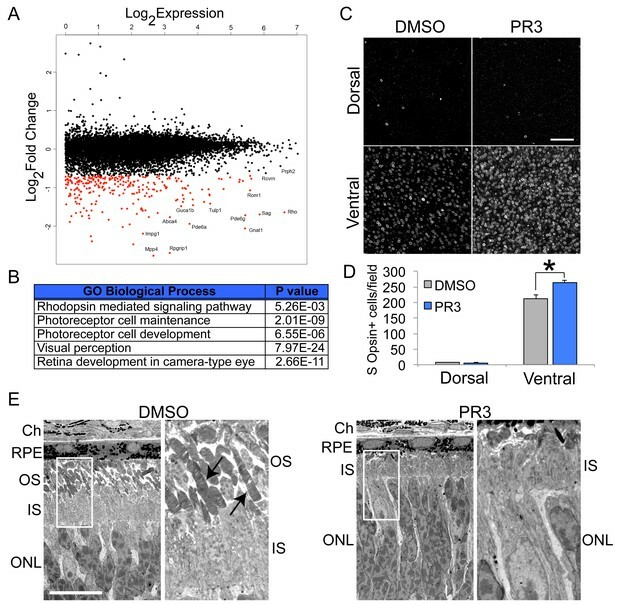 To determine if PR3 treatment also affects cone gene expression, we explanted intact retinas from P11 wild type mice in media containing DMSO or PR3 for 3 days. We used intact retinas for this experiment to assess changes in dorsal and ventral retina independently. After fixation and whole mount immunostaining, we counted S Opsin+ cells in the dorsal and ventral retina. Similar to Nr2e3 mutations, treatment with PR3 resulted in an increase in the number of S Opsin+ cells in the ventral, but not dorsal retina (Figure 1D–E). PR3 was initially identified as a chemical modulator of Nr2e3 in a luciferase-based assay that identified ligands by disruption of the Nr2e3-NCoR dimer complex and had a calculated IC50 of 0.07 μM in this assay (PubChem Assay IDs: 602229, 624378, 624394, and 651849). To confirm a direct Nr2e3-PR3 interaction, we used isothermal titration calorimetry (ITC). Consistent with our other assays, ITC qualitatively showed a direct interaction between PR3 and Nr2e3 (Figure 1F; estimated Kd of 67 μM using a one site model). The initial screen that identified PR3 demonstrated its effects on Nr2e3 in a co-repression assay with NCoR; however, the effects we observed on rod gene expression suggested that PR3 also inhibits the co-activator function of Nr2e3. To explore this possibility, we assessed the effects of PR3 on the ability of Nr2e3 to cooperate with Nrl and Crx, two other transcription factors known to form a co-activation complex for rod gene expression. We first transfected HEK cells with Nr2e3, Nrl, and Crx and measured activation of the Rhodopsin promoter in the presence of DMSO or PR3. PR3 strongly reduced Rhodopsin promoter activation (Figure 1—figure supplement 1A). We next used co-immunoprecipitation to assess whether PR3 affects the interaction between Nr2e3 and Nrl in HEK 293 cells. We found that PR3 caused an increase in the binding of Nr2e3 to Nrl (Figure 1—figure supplement 1B–C). Several reports have shown that ligand binding to nuclear receptors stabilizes interactions with co-activators by stabilizing the structure of the ligand-binding domain and co-activator binding sites (Onishi et al., 2010; Jia et al., 2009; Forrest and Swaroop, 2012; Fu et al., 2014). It is not clear why stabilizing the complex would reduce its activity; however, it may be that stabilizing interactions with Nr2e3 prevents Nrl and Crx from interacting with consensus sites on the DNA, or alternatively prevents the recruitment of other components of the transcriptional machinery. Nevertheless, our results indicate that PR3 affects the formation or stabilization of the complex among these critical rod gene regulators. Although PR3 was identified in an assay for Nr2e3, it is also possible that it interacts with other nuclear receptors. Two related nuclear receptors that are expressed in photoreceptors are Errb and Rorb. Deletion of these genes in mice has effects on rod gene expression (Onishi et al., 2010; Jia et al., 2009; Forrest and Swaroop, 2012; Fu et al., 2014). However, small molecule modulators of ERRb induce rapid rod death (Onishi et al., 2010), and so it is unlikely that PR3 acts through this pathway. Loss of function Rorb mutations reduce rod gene expression and lead to a phenotype more like what we observe with PR3 treatment. To determine whether PR3 might also act through antagonism of RORb we transfected HEK 293 cells with RORb and Crx and measured activation of the S Opsin promoter, a known target of RORb. In transfected HEK 293 cells, RORb and Crx synergistically activate the S Opsin promoter (Srinivas et al., 2006; Liu et al., 2017). Treatment with PR3 did have a small effect on RORb-Crx driven activation of the S Opsin promoter (Figure 1—figure supplement 1D); however, this effect was much smaller than what we found for PR3 on activation of the Rhodopsin promoter by Nr2e3, Nrl, and Crx (Figure 1—figure supplement 1A). To further evaluate a role for PR3 as an RORb antagonist, we analyzed downstream RORb target gene expression in developing retina. One target that is specific to RORb, but not regulated by Nr2e3 is Prdm1 (Liu et al., 2017; Wang et al., 2014; Mills et al., 2017). Prdm1 expression was unchanged in P0 retinal explants treated with PR3 (Figure 1—figure supplement 1E), supporting our hypothesis that the effects of PR3 are primarily mediated through modulation of Nr2e3. To further evaluate whether PR3 has other targets in the retina, we tested PR3 in Rd7 retinas, which harbor a spontaneous mutation in Nr2e3 (Akhmedov et al., 2000; Haider et al., 2001; Chen et al., 2006). We explanted adult (P23-35) retinas from wild type and Rd7 mice in media containing DMSO or PR3 and measured Rhodopsin expression by qPCR. Consistent with the hypothesis that the effects of PR3 on rod gene expression are mediated through Nr2e3, PR3 caused a significant reduction in Rhodopsin expression in wild type retinas but not in retinas from Rd7 mice (Figure 1G). While this experiment confirms Nr2e3 specificity of PR3, it remains unclear why Rd7 retinas exhibit only moderate reductions in rod gene expression (Corbo and Cepko, 2005; Peng et al., 2005; Chen et al., 2005; Haider et al., 2001), while PR3 treatment or CRISPR-Cas9 deletion of Nr2e3 (Zhu et al., 2017) result in substantial decreases. This suggests that there is some developmental compensation that is not present when the gene is deleted or inhibited in postmitotic rods; alternatively, PR3 may be acting in a dominant-negative manner, and inhibiting the ability of the Nr2e3-Nrl-Crx complex to function properly. Nr2e3 signaling is important for rod photoreceptor cell fate, development and maturation, and maintenance of expression. To determine the effect of PR3 treatment on gene expression in postmitotic retinal cells, we systemically treated (intraperitoneal injection; IP) wild type mice with PR3 or vehicle at P12. At P13, 24 hr after the injection, we collected the retinas for global transcriptome analysis by RNA sequencing. As hypothesized, we observed a decrease in most rod photoreceptor-specific transcripts (Figure 2A–B). Similar to conditional knockout of Nrl in adult mice and knockdown of Nrl by CRISPR/Cas9 in postmitotic photoreceptors, we did not observe global increases in cone gene expression (Montana et al., 2013; Yu et al., 2017). Nevertheless, we did observe an increase in the number of S Opsin+ cells in the ventral retina with PR3 treatment in vivo (Figure 2C–D). Genes expressed in both rod and cone photoreceptors, eg. Crx and Otx2, showed no difference in expression between control and PR3 treatment. In vivo characterization of PR3 treatment. (A) RNA sequencing results plotting log2FoldChange against log2Expression (RPKM) of wild type mice treated with DMSO vehicle or 10 mg/kg PR3 shows robust reduction in rod photoreceptor genes. (n = 2 mice per condition; values graphed are the mean of the two biological replicates) (B) Gene ontology analysis (http://geneontology.org/page/go-enrichment-analysis) results for largest changes (top 100) in gene expression assessed by RNA sequencing. (C) Whole mount S Opsin staining of retinas from mice treated with 10 mg/kg PR3 or DMSO vehicle for 3 days. Scale bar represents 25 μm. (D) Retinas from mice treated with PR3 had more S Opsin+ cells per 100 μm x 100 μm field in the ventral, but not dorsal, retina compared to controls (n = 4 biological replicates; value graphed is the mean ±SEM of the biological replicates, *p=0.0086, two-tailed t-test assuming equal variance). (E) Electron microscope micrographs of retinal sections of wild type mice treated with DMSO or 10 mg/kg PR3 (n = 2 mice per condition). Compared to DMSO controls, PR3 retinas have arrested outer segment development (arrows indicate outer segments in DMSO treated mice). Scale bare represents 10 μm. We next used electron microscopy (EM) to perform an ultrastructural analysis of photoreceptor morphology after PR3 treatment. We carried out IP injections of vehicle or PR3 in wild type mice for three consecutive days starting at P11. At P14, 24 hr after the third injection, we euthanized the mice and processed their retinas for EM. Photoreceptor outer segments begin to form during the second and third postnatal week; mutations in Nr2e3 lead to an impairment in rod outer segment formation, and we predicted that PR3 treatment would affect their development in a similar way (Haider et al., 2006). As predicted, PR3 treatment prevented outer segment development; outer segments of PR3-treated photoreceptors were strikingly truncated compared to controls (Figure 2E). We did not observe any indication of photoreceptor apoptosis induced by PR3 treatment upon examination of outer nuclear layer (ONL) nuclei (Figure 2E), further indicating that the effects on rod development were not due to an increase in cell death. We have recently shown that reductions in rod gene expression caused by treatment with PR1 were sufficient to slow the degeneration of RhoP23H photoreceptors in vitro (Nakamura et al., 2016). The RhoP23H mutation causes misfolding of Rhodopsin in rod photoreceptors, which leads to activation of the unfolded protein response and eventually results in rod and cone death (Nguyen et al., 2014). In RhoP23H mice, most rod photoreceptors undergo apoptosis by the end of the third postnatal week (Sakami et al., 2011). To determine whether we could prevent photoreceptor degeneration in this model, we treated RhoP23H mice with PR3 or vehicle from P12-P14 until P21, during the period of rod photoreceptor death (Figure 3A). At P21, we assessed visual function with ERGs and euthanized the mice for histological and qPCR analyses. At P21, control RhoP23H mice had only 2–3 rows of photoreceptors remaining in their ONL (Figure 3B–C). Rods were sparse and there were few remaining cones (S Opsin+ and Cone Arrestin+ photoreceptors). 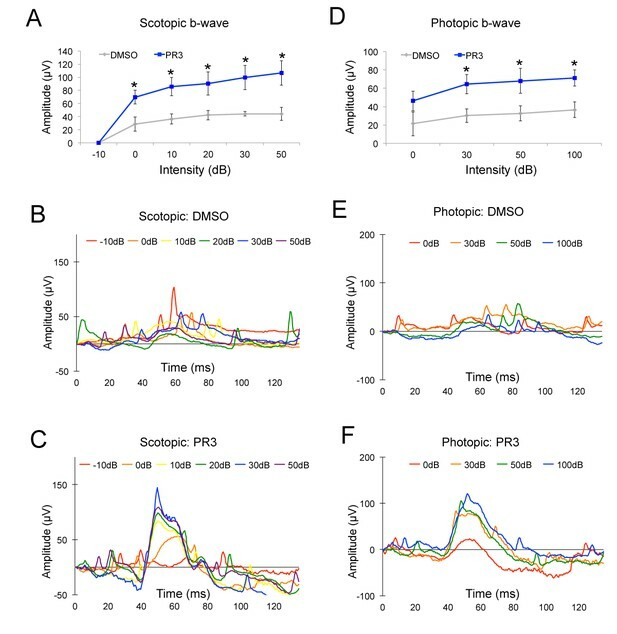 Control RhoP23H mice had minimal scotopic and photopic b-wave amplitudes by ERG analysis (Figure 4A, B, D and E). By contrast, retinas from PR3-treated RhoP23H mice had several rows of rod and cone photoreceptors in the ONL (Figure 3B–C). The surviving cones in the PR3-treated retinas were more elongated and healthier than in the DMSO control retinas. We confirmed our histological results with qPCR on retinas from control and PR3 RhoP23H mice and found that treated mice had more expression of Recoverin and Rhodopsin, indicating greater photoreceptor cell survival (Figure 3D). ERG analysis of PR3-treated RhoP23H mice showed significantly elevated scotopic and photopic b-wave amplitudes at most stimulation intensities compared to littermate controls (Figure 4A, C, D and F). Together, these data support the conclusion that PR3 treatment prevented structural and functional degeneration of photoreceptors in this model of RP. PR3 slows the progression of photoreceptor degeneration in the RhoP23H mouse model of RP. (A) Timeline of photoreceptor degeneration in the RhodopsinP23H mouse and experimental design. 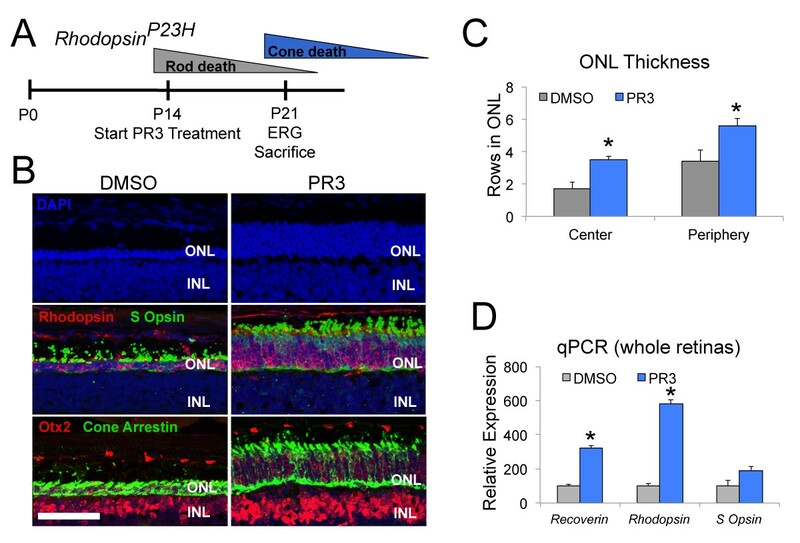 (B) Immunofluorescence staining for Rhodopsin, S Opsin, Otx2, and Cone Arrestin on retinal sections from RhodopsinP23H mice demonstrate preservation of photoreceptors with PR3 treatment. Scale bar represents 50 μm. (C) Counts for rows of DAPI+ cells in the central and peripheral ONL show greater survival of photoreceptors with PR3 treatment (n = 7 mice for DMSO treatment and 8 mice for PR3; values graphed are the mean ±SEM of the biological replicates, p=0.0014 for center and 0.015 for periphery, two-tailed t-test assuming equal variance). 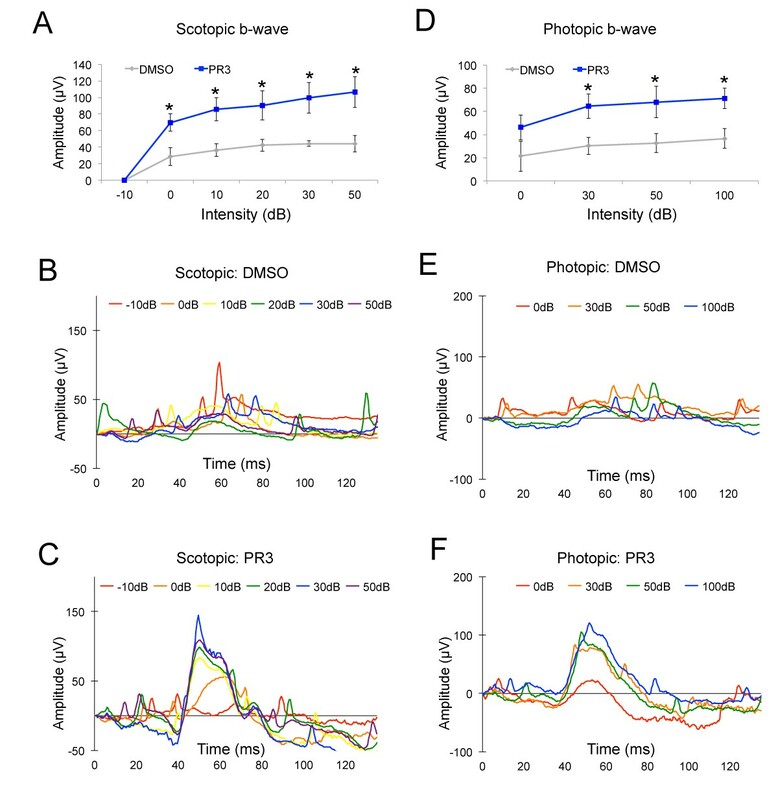 (D) qPCR on whole retinas from RhodopsinP23H mice treated with DMSO or PR3 shows greater expression of photoreceptor genes Recoverin, Rhodopsin, and S Opsin with PR3 treatment (n = 6 mice for DMSO and 7 mice for PR3; values graphed are the mean ±SEM of the biological replicates, p=1.73E-05 for Recoverin, 3.13E-05 for Rhodopsin, and 0.076 for S Opsin, two-tailed t-test assuming equal variance on ΔCT values). PR3 preserves visual function in the RhodopsinP23H mouse. (A) Scotopic b-wave amplitudes from P21 RhodopsinP23H mice treated with 10 mg/kg PR3 or DMSO vehicle (n = 4 mice for DMSO treatment and 8 mice for PR3 treatment, values graphed are the mean ±SEM of the biological replicates, p=0.025, 0.012, 0.032, 0.021, and 0.015 for 0, 10, 20, 30, and 50 Decibels (dB) respectively, two-tailed t-test assuming unequal variance). (B) Representative scotopic ERG waveforms from a single DMSO vehicle mouse. (C) Representative scotopic ERG waveforms from a single PR3–treated mouse. (D) Photopic b-wave amplitudes from P21 RhodopsinP23H mice treated with 10 mg/kg PR3 or DMSO vehicle (n = 4 mice for DMSO treatment and 8 mice for PR3 treatment, values graphed are the mean ±SEM of the biological replicates, p=0.18, 0.025, 0.048, and 0.021 for 0, 30, 50, and 100 dB respectively, two-tailed t-test assuming unequal variance). (E) Representative photopic ERG waveforms from a single control mouse. (F) Representative photopic ERG waveforms from a single PR3-treated mouse. In this study we successfully prevented photoreceptor degeneration in the RhoP23H mouse, the first report of successful treatment of this RP model with a small molecule in vivo. Our strategy was to reduce the expression of photoreceptor genes by targeting the rod-specific nuclear receptor Nr2e3 with a small molecule modulator. Treatment with PR3 decreased rod gene expression, and was sufficient to functionally and structurally preserve photoreceptors in the RhoP23H mouse. Previous studies have shown that genetic manipulation of the rod photoreceptor differentiation pathway may be useful for the treatment of multiple RP models. Conditional deletion of Nrl in adult mouse rods prevents degeneration in the Rho−/− model of recessive RP (Montana et al., 2013). More recently, knockdown of Nrl or Nr2e3 by AAV-CRISPR/Cas9 gave long-term histological and functional preservation of photoreceptors in numerous RP models (Zhu et al., 2017; Yu et al., 2017). Our report now shows that a small molecule targeting this same regulatory pathway is also effective at slowing rod degeneration in a particularly aggressive RP model and provides a novel target for medical therapy of retinal degeneration. C57Bl/6 (Jackson Stock No: 000664), RhoP23H (Sakami et al., 2011)(Jackson Stock No: 017628), and Nr2e3Rd7 (Jackson Stock No: 004643) mice were used at the indicated ages. All mice were housed by the Department of Comparative Medicine at the University of Washington and protocols were approved by the University of Washington Institutional Animal Care and Use Committee. The research was carried out in accordance with the ARVO statement for the Use of Animals in Ophthalmic and Vision Research. For all experiments, a sample size of at least four mice per condition was chosen to ensure adequate power to detect a pre-specified effect size. From each litter, half of the animals were randomly assigned to the control group and the other half to the experimental group, and no animals were excluded. Photoregulin3 was identified by searching previous small molecule screens with PubChem for Nr2e3 interacting molecules. It was initially obtained from ChemDiv and then synthesized and purified in large quantities in the lab after initial screening. For in vivo experiments, mice were injected intraperitoneally with PR3 dissolved in DMSO at 10 mg/kg. Retinas were dissected from postnatal day 5 (P5) mice and dissociated by treatment with 0.5% Trypsin diluted in calcium- and magnesium-free HBSS for 10 min at 37°C. Trypsin was inactivated by adding an equal volume of FBS and cells were pelleted by centrifugation at 4°C and resuspended in media (Neurobasal-A containing 1% FBS, 1% N2, 1% B27, 1% Pen/Strep, and 0.5% L-Glutamine). For the immunofluorescence assay, cells were plated into 96-well black walled, clear bottom tissue culture plates at a density of 1 retina/5 wells. Small molecules were diluted in media and were added the day following dissociation. After two days of treatment, cells were fixed with 4% PFA for 20 min at room temperature, blocked with blocking solution (10% Normal Horse Serum and 0.5% Triton X-100 diluted in 1X PBS) for 1 hr at room temperature, and incubated overnight at 4°C with primary antibodies generated against Rhodopsin (1:250; Rho4D2, Gift from Dr. Robert Molday, UBC) diluted in blocking solution. The following day, wells were washed with 1X PBS and then incubated with species appropriate, fluorescently labeled secondary antibodies diluted in blocking solution for 1 hr at room temperature. Wells were washed three times, counterstained with ToPro3, and the entire plate was imaged using a GE Typhoon FLA 9400 imager. Optical density measurements were obtained from the plate scans using ImageJ software and Rhodopsin expression was normalized to ToPro3 nuclear stain. RNA from retinas was isolated using TRIzol (Invitrogen) and cDNA was synthesized using the iScript cDNA synthesis kit (Bio-Rad). SSO Fast (Bio-Rad) was used for quantitative real-time PCR. For analysis, values were normalized to Gapdh (ΔCT) and ΔΔCT between DMSO and compound-treated samples was expressed as percent of DMSO treated controls (100*2^ΔΔCt). t-tests were performed on ΔCT values. The following primer sequences were used: Gapdh (F: GGCATTGCTCTCAATGACAA, R: CTTGCTCAGTGTCCTTGCTG), Rhodopsin (F: CCCTTCTCCAACGTCACAGG, R: TGAGGAAGTTGATGGGGAAGC), Opn1sw (F: CAGCATCCGCTTCAACTCCAA, R: GCAGATGAGGGAAAGAGGAATGA), Recoverin (F: ACGACGTAGACGGCAATGG, R: CCGCTTTTCTGGGGTGTTTT), Otx2 (F: CCGCCTTACGCAGTCAATG, R: GAGGGATGCAGCAAGTCCATA), and Prdm1 (F: TTCTCTTGGAAAAACGTGTGGG, R: GGAGCCGGAGCTAGACTTG). Intact retinas without RPE from mice at the indicated ages and genotypes were explanted on 0.4 μm pore tissue culture inserts in media (Neurobasal-A containing 1% FBS, 1% N2, 1% B27, 1% Pen/Strep, and 0.5% L-Glutamine) containing DMSO or 0.3–1.0 μM PR3. Full media changes were performed every other day. Explants or eye cups were fixed with 4% PFA for 20 min at room temperature, blocked with blocking solution (10% normal horse serum and 0.5% Triton X-100 diluted in 1X PBS) for 1 hr at room temperature, and incubated overnight at 4°C with primary antibodies generated against S Opsin (1:400, SCBT, sc-14363). The following day, the retinas were washed with 1X PBS, and then incubated with a species appropriate, fluorescently-labeled secondary antibody diluted in blocking solution overnight, followed by washing with 1X PBS and DAPI staining. The retinas were transferred to slides and coverslipped with Fluoromount-G (SouthernBiotech). An Olympus FluoView FV1000 was used for confocal microscopy. Cells were counted from single plane confocal images taken at fixed settings. Eyecups were fixed in 4% PFA in 1X PBS for 20 min at room temperature and then cryoprotected in 30% sucrose in 1X PBS overnight at 4°C. Samples were embedded in OCT (Sakura Finetek), frozen on dry ice, and then sectioned at 16–18 μm on a cryostat (Leica). Slides were blocked with a solution containing 10% normal horse serum and 0.5% Triton X-100 in 1X PBS for 1 hr at room temperature and then stained overnight at 4°C with primary antibodies (Rho4D2 at 1:250 from Dr. Robert Molday, S Opsin at 1:400 from SCBT: sc-14363, Cone Arrestin at 1:1000 from Millipore: AB15282, Otx2 at 1:200 from R and D Systems: BAF1979) diluted in blocking solution. Slides were washed three times with 1X PBS the following day and then incubated in fluorescently labeled secondary antibodies diluted in blocking solution for 2 hr at room temperature, stained with DAPI, washed, and coverslipped using Fluoromount-G (SouthernBiotech). An Olympus FluoView FV1000 was used for confocal microscopy. Cells were counted from single plane confocal images taken at fixed settings. Counts in the central retina were taken adjacent to the optic nerve head (50 μm from the nerve head on the ventral side) and counts in the peripheral retina were taken 50 μm from the peripheral edge on the ventral side. NR2E3 protein (aa 90–410) was expressed as an His8-MBP-TEV fusion protein from the expression vector pVP16 (DNASU Plasmid ID: HsCD00084154). E. coli BL21 (DE3) cells were grown to an OD600 of 1, and then induced with 0.2 mM IPTG at 16°C overnight. Cells were harvested, resuspended in extract buffer (20 mM Tris pH 8, 200 mM NaCl, 10% glycerol, 5 mM 2-mercaptoethanol, and saturated PMSF diluted 1:1,000), and then lysed by sonication on ice. Lysates were centrifuged at 4°C and the supernatant was loaded onto an equilibrated column containing 5 mL of Ni-NTA agarose (Qiagen). The column was washed with 20 mM Tris pH 8, 1M NaCl, 5 mM 2-mercaptoethanol, and 40 mM imidazole, and then the protein was eluted with 20 mM Tris pH 8, 200 mM NaCl, 5 mM 2-mercaptoethanol, and 100 mM imidazole. The fusion protein was incubated with TEV overnight at 4°C and then the His8-MBP tags were separated from NR2E3 by ion exchange chromatography. For isothermal titration calorimetry, 100 μM PR3 was injected into 20 μM NR2E3 in 10 mM Sodium Phosphate buffer pH 8 with 50 mM NaCl and 0.5% DMSO in a MicroCal ITC-200 (Malvern) and the data was analyzed with Origin 7.0 software. RNA from retinas was isolated using TRIzol (Invitrogen) and total RNA integrity was checked using an Agilent 4200 TapeStation and quantified with a Trinean DropSense96 spectrophotometer. RNA-seq libraries were prepared from total RNA using the TruSeq RNA Sample Prep kit (Illumina) and a Sciclone NGSx Workstation (PerkinElmer). Library size distributions were validated using an Agilent 4200 TapeStation. Additional Library quality control, blending of pooled indexed libraries, and cluster optimization were performed using Life Technologies’ Invitrogen Qubit Fluorometer. RNA-seq libraries were pooled (4-plex) and clustered onto a flow cell lane. Sequencing was performed using an Illumina HiSeq 2500 in rapid mode employing a paired-end, 50 base read length (PE50) sequencing strategy. Mice were euthanized by CO2, and then perfused with 0.9% saline followed by 4% glutaraldehyde in 0.1 M sodium cacodylate buffer. Eye cups were fixed in 4% glutaraldehyde in 0.1 M sodium cacodylate buffer, washed with 0.1 M sodium cacodylate buffer, and then post-fixed in 2% osmium tetroxide. After fixation, eye cups were washed with water, dehydrated through a graded series of ethanol, incubated in propylene oxide and then epon araidite, polymerized overnight at 60°C, and then sectioned at a thickness of 70 nm. Images were obtained using a JEOL JEM-1230 electron microscope. Mice were dark adapted overnight (12–18 hr). All subsequent steps were carried out under dim red light. Mice were placed in an anesthesia chamber and anesthetized with 1.5–3% isoflurane gas. Mice were transferred from the anesthesia chamber to a heated platform maintained at 37 ˚C and positioned in a nose cone to maintain a constant flow of Isoflurane. Drops of 1% tropicamide and 2.5% phenylephrine Hydrochloride were applied to each eye. A reference needle electrode was placed subdermally on the top of the head and a ground needle electrode was placed subdermally in the tail. Drops of 1.5% methyl cellulose were applied to each eye and contact lens electrodes were placed over each eye. Dim red light was turned off and the platform was positioned inside of an LKC Technologies UTAS BigShot ganzfeld and a series of flashes of increasing intensity were delivered scotopically. A series of photopic flashes were performed immediately following the series of scotopic flashes. HEK293 cells were transfected with 1 μg of the luciferase reporter BR-225Luc (Dr. Shiming Chen) or S Opsin 600 pGL3 (Dr. Douglas Forrest), 1 ng of the control pRL-CMV (Promega) and 100 ng of hNRL-pCMVSport6 (Open Biosystems), hCRX-pCMVSport6 (Open Biosystems), hNR2E3-pcDNA3.1/HisC (Dr. Shiming Chen), or hRORB-pLenti6.2/V5-DEST (DNASU) in 24-well plates using Lipofectamine 3000 reagent (Thermo Fisher Scientific). Transfection reagents were removed the following day and replaced with media containing DMSO or 1 μM PR3 for 2 days. Cells were lysed and firefly and renilla luciferase activity was measured with the Dual-Luciferase Reporter Assay System (Promega) using a 1420 Multilabel Victor3V plate reader. HEK293 cells were transfected in 6-well tissue culture plates with lipofectamine 3000 (Thermo Fisher Scientific) and 800 ng of each hNRL-pCMVSport6 (Open Biosystems) and hNR2E3-pcDNA3.1/HisC (Dr. Shiming Chen) in Opti-MEM media. Transfection reagents were removed after 24 hr and replaced with media containing DMSO or 1 μM PR3 for 2 days. Cells were lysed with Co-IP lysis buffer (25 mM Tris-HCl pH 7.5, 150 mM NaCl, 1 mM EDTA, 1% Triton X-100, 5% glycerol and 1X protease inhibitor cocktail). Sheep anti-mouse IgG magnetic Dynabeads were incubated with anti-Nr2e3 antibody (5 μg/precipitation) diluted in Co-IP buffer for 2 hr at 4°C. Equal volume of lysate were then added to the antibody-coated beads and incubated overnight at 4°C. The following day, beads were washed four times with Co-IP buffer and then incubated at 85°C for 15 min in 1X sample buffer diluted in Co-IP buffer. Samples were loaded and run in a 4–20% SDS gel (Bio-Rad). Protein was transferred to a PVDF membrane (Thermo Fisher Scientific), blocked (5% BSA and 0.1% Tween 20 in 1X PBS) for at least 1 hr at room temperature and stained with primary antibodies anti-Nrl (Chemicon) or Anti-Nr2e3 (R and D systems) diluted in blocking solution overnight at 4°C. Membranes were washed with 0.1% Tween 20 in 1X PBS and then incubated with Clean-Blot IP Detection Reagent (Thermo Fisher Scientific) diluted in blocking solution for 1 hr at room temperature. Signals were visualized on X-ray film with SuperSignal West Dura Extended Duration Substrate (Thermo Fisher Scientific) and quantified using ImageJ software. American Journal of Human Genetics 32:223–235. Journal of Biological Chemistry 289:32469–32480. Current Topics in Developmental Biology 125:227–255. Investigative Opthalmology & Visual Science 57:6407–6415. Advances in Experimental Medicine and Biology 801:471–476. Journal of Biological Chemistry 286:10551–10567. Thank you for submitting your manuscript "Small molecule Photoregulin3 prevents retinal degeneration in the RhoP23H mouse model of retinitis pigmentosa" to eLife. The manuscript has been reviewed by three expert reviewers, and their assessments together with my own (Jeremy Nathans) as Reviewing Editor, forms the basis of this letter. The process was overseen by Senior editor Gary Westbrook. I am also including the three reviews in their original form at the end of this letter, as there are many specific and useful suggestions in them that will not be repeated in the summary here. The following individuals involved in review of your submission have agreed to reveal their identity: Joseph C Corbo (Reviewer #2) and Bo Chen (Reviewer #3). The reviewers and I think that the identification of small molecule Nr2e3 antagonists is important and that exploring the application of these antagonists in a rod-to-cone conversion strategy for treatment of RP is exciting. However, we have concerns about the incompleteness of the data and its interpretation. In particular, our central concern is that it is not clear whether PR3 action in vivo is through Nr2e3 or might be an off-target effect (or a combination of the two). "There is an apparent discrepancy between the Nr2e3 KO phenotypes and the implied mechanisms of PR3 rescuing P23H degeneration, namely the mild rod gene reduction and strong cone gene derepression in the Nr2e3 KO versus the strong rod gene reduction and relatively normal cone gene expression in the in vivo PR3 treatment. A discrepancy between a genetic KO and pharmacological perturbation certainly could be due to interesting real biology (elaborated below), but could also be a red flag for the not-so-uncommon off-target effects. In either case, I feel it is necessary to establish whether PR3 acts through NR2E3. This is important because if off-target, it requires a major reinterpretation and because in its current form, the manuscript seems misleading for the field by equating Nr2e3 inhibition to Nrl inhibition with regard to retarding retinal degeneration. As pointed out already, we could ask for data showing whether genetic deletion of Nr2e3 is protective in the P23H model. If the data are unavailable or contradictory (i.e. no protection), the observed rescue could be due to effects from acute pharmacological inhibition that can only be modeled by a conditional knock-out model (e.g. some compensatory mechanism leading to a milder phenotype in the germline Nr2e3 null). Alternatively, PR3 might function as an inverse agonist and induce some gain of function from the NR2E3 protein, as Joe suggested. There are at least two conceivable scenarios. First, NR2E3 binds to both rod and cone gene promoters and functions as a weak activator for rod genes (possibly inhibited by NRL/CRX) but a strong repressor for cone genes (on its own). PR3 somehow locks NR2E3 into a strong repressor on both rod and cone promoters. Second, PR3 enhances interaction between NR2E3 and NRL/CRX such that PR3-bound NR2E3 depletes NRL/CRX that would otherwise activate rod genes. Interestingly, their first compound PR1 was reported in their IOVS paper to enhance NR2E3/NRL/CRX complex formation in a heterologous system, although no explanation was given. Regardless of the actual mechanisms, the effect of PR3 in reducing rod genes beyond the Nr2e3 genetic null should depend on the presence of NR2E3 protein; this could be tested by treating Nr2e3 KO with PR3. Specifically, one could measure the reduction in rhodopsin expression under the treatment regimen (not just 24 hrs) in wildtype mice; this reduction is expected to disappear in the Nr2e3 KO if PR3 acts through NR2E3. This doesn't require crossing mice and should be do-able within a reasonable time frame. This could at least rule out a trivial explanation of the rescue: non-specific developmental delay in mutant rhodopsin expression and hence delay in manifestation of retinal degeneration. In any event, the possibility of off-target effects should certainly be discussed, and the 67 μm Kd in ITC explained." This manuscript is an addition to the emerging theme of treating rod degeneration via rod-to-cone reprogramming. Proof-of-principle studies by other labs showed that genetic deletion of Nrl leads to functional improvement in multiple mouse models of retinal degeneration. The authors sought to pharmacologically inhibit Nr2e3, a transcription factor downstream of Nrl, and identified in a chemical screen several Nr2e3 inhibitors, one of which (PR1) they have published and inhibits rod gene expression while increasing cone gene expression in culture. In this manuscript, the authors reported a structurally unrelated chemical (PR3) and tested its effect on rod/cone gene expression and rescuing retinal degeneration in a mouse model carrying a dominant rhodopsin mutation. While the clinical significance and striking rescue phenotypes would be appropriate for eLife, this reviewer would like to see additional evidence to rule out off-targets given the potential discrepancy between genetic and pharmacological inactivation of Nr2e3. The Nrl mutant retinas expresses little rhodopsin, but the Nr2e3 mutant retinas have a very limited decrease in rhodopsin expression, especially at 2-3 postnatal weeks that are of interest here. This, together with the likely partial inhibition characteristic of pharmacological approaches, raises the question whether a partial inhibition of Nr2e3 would lead to a functionally-relevant decrease in mutant rhodopsin expression, as achieved via genetic deletion of Nrl. In the absence of genetic deletion of Nr2e3 (similar to the Nrl experiments), a necessary experiment would be to measure rhodopsin downregulation in wild type mice under the same treatment regimen as in the rhodopsin mutant mice (not just 24 hr post treatment at a different postnatal day). How do the authors rule out the possibility that the rescue of degeneration is simply due to a non-specific delay in development and hence a delay in degeneration? Other retinal cells might not be the best control if they are not actively developing during this time window. Are there other organs/cells known to develop rapidly at the time of PR3 treatment? Related to this, this reviewer is confused about why the ITC Kd measuring the direct interaction is 100 times higher than the effective biological concentration in culture. This reviewer doesn't see "rod nuclei of PR3-treated retinas contained smaller patches of densely packed heterochromatin" in Figure 2C. This needs to be quantified or deleted. The original chemical screen is based on disruption of the interaction between Nr2e3 and a transcriptional co-repressor, NCoR. It should be discussed how such disruption and presumable loss of transcriptional inhibition lead to, counterintuitively, a decrease in rhodopsin expression and/or disruption of the suggested Nrl/Nr2e3/Crx complex. 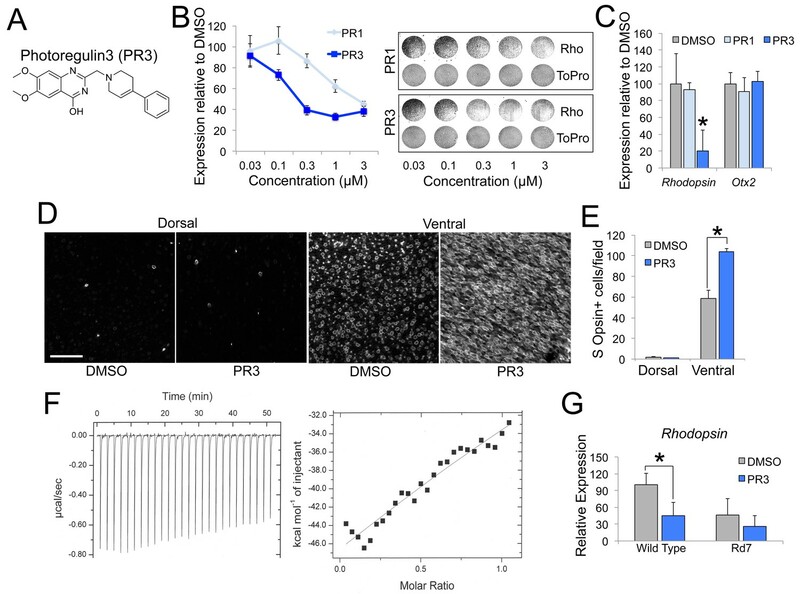 In this exciting study, the authors present the identification of a small molecule (photoregulin3 or PR3) which is capable of retarding the progression of photoreceptor degeneration in the RhodopsinP23H mutant mouse, a model for retinitis pigmentosa. This study is a follow-up on a previous study from the same group (Nakamura et al., 2016) which identified another small molecule, photoregulin1, with related properties. These two reports form part of a growing body of work from several groups which suggests that genetic or chemical inhibition of the transcriptional pathway regulating rod gene expression (Nrl -> Nr2e3) can confer protection against photoreceptor degeneration in a range of genetic models of blindness. The present study is important because it is the first to demonstrate efficacy of a small molecule (PR3), putatively targeting this pathway, in preventing photoreceptor degeneration in vivo. There are several issues that, if addressed, would strengthen the conclusions of the study. First, some of the experiments appear to have been performed in very few, or even a single, biological replicate. For example, the data presented in Figure 1B (the effects of PR1 and PR3 on Rho expression by qPCR) show a single biological replicate. To solidify this result, three biological replicates should be presented. Similarly, only two biological replicates are presented in Figure 1C. I suspect that addition of a third biological replicate is unlikely to materially affect the conclusions derived from this experiment, but I would normally have expected at least three biologic replicates for an experiment of this sort. It was unclear from the text how many biological replicates were performed for the RNA-seq experiment presented in Figure 2A. At a minimum, two biological replicates are needed and three are preferred. Nakamura et al. presented results reporting that photoregulin3 (PR3), identified from a small molecule screen as an inhibitor of Nr2e3, regulates photoreceptor gene expression and morphology in the wildtype retinas, and very interestingly, in vivo treatment with PR3 preserves both rod and cone photoreceptors and rescues retinal function in Rho-P23H mice, a knock-in mouse model of autosomal dominant retinitis pigmentosa (adRP). Ne2e3 is located downstream of Nrl to promote rod cell fate while suppressing the expression of cone genes. Reduction of Nrl expression by targeted deletion (Matana et al., 2013) or Crispr/Cas9-mediated knockdown (Yu et al., 2017) retarded retinal degeneration and partially preserved retinal function, through a mechanism that rods could be partially converted to cones in the adult mouse retina. The authors presented convincing evidence that similar to Nrl knockdown, chemical inhibition of Ne2e3 by PR3 suppressed rod phenotype, although not completely clear if rods were undergoing conversion to cones, and prevented photoreceptor death in Rho-P23H mice at young age (postnatal day 21). The research is well presented with a potentially high impact for the treatment of adRP with PR3. 1) The P23H homozygous mice were used in the retinal degeneration studies. The use of P23H/WT rhodopsin heterozygous mice would have been more appropriate to mimic the human disease as the P23H mutated protein is co-expressed with the wild-type rhodopsin protein. 2) Please show representative images that PR3 treatment reduced rhodopsin expression in dissociated retinal cultures. 3) In Figure 1D, the authors showed that PR3 treatment enhanced s-opsin expression in the ventral retina. What happens to the s-opsin expression in the dorsal retina? 4) Does IP injection of PR3 in intact mice at P13 lead to upregulation of s-opsin as happens to the explants culture? 5) Shown in Figure 2C, the authors claimed that PR3 treatment affected photoreceptor outer segment development. The outer segments consist of densely packed membrane discs where visual pigments and essential proteins for phototransduction are housed. Do membrane discs appropriately form in the PR3-treated retinas? Please show high-resolution EM pictures to clarify. 6) To rescue photoreceptors in P23H homozygous mice, PR3 treatment started at P12-P14, and the results were analyzed a week later at P21. adRP caused by P23H mutation is a chronic degenerative condition, commonly spanning decades in human patients. It is interesting to know how long the protective effects last. Are photoreceptors still protected when the treated mice are analyzed at 6 or 8 weeks of age? […] “Specifically, one could measure the reduction in rhodopsin expression under the treatment regimen (not just 24 hrs) in wildtype mice; this reduction is expected to disappear in the Nr2e3 KO if PR3 acts through NR2E3. This doesn't require crossing mice and should be do-able within a reasonable time frame. This could at least rule out a trivial explanation of the rescue: non-specific developmental delay in mutant rhodopsin expression and hence delay in manifestation of retinal degeneration. In any event, the possibility of off-target effects should certainly be discussed, and the 67 μm Kd in ITC explained." "To further evaluate whether PR3 has other targets in the retina, we tested PR3 in Rd7 retinas, which harbor a spontaneous mutation in Nr2e3 [27-29]. We explanted adult retinas from wild type and Rd7 mice in media containing DMSO or PR3 and measured Rhodopsin expression by qPCR. Consistent with the hypothesis that the effects of PR3 on rod gene expression are mediated through Nr2e3, PR3 caused a significant reduction in Rhodopsin expression in wild type retinas, but not in retinas from Rd7 mice (Figure 1G). While this experiment confirms that Nr2e3 is a key target of PR3, it remains unclear why Rd7 retinas exhibit only moderate reductions in rod gene expression [11-13, 28], while PR3 treatment or CRISPR-Cas9 deletion of Nr2e3  result in substantial decreases. This suggests that there is some developmental compensation that is not present when the gene is deleted or inhibited in postmitotic rods; alternatively, PR3 may be acting in a dominant-negative manner, and inhibiting the ability of the Nr2e3-Nrl-Crx complex to function properly." […] The Nrl mutant retinas expresses little rhodopsin, but the Nr2e3 mutant retinas have a very limited decrease in rhodopsin expression, especially at 2-3 postnatal weeks that are of interest here. This, together with the likely partial inhibition characteristic of pharmacological approaches, raises the question whether a partial inhibition of Nr2e3 would lead to a functionally-relevant decrease in mutant rhodopsin expression, as achieved via genetic deletion of Nrl. In the absence of genetic deletion of Nr2e3 (similar to the Nrl experiments), a necessary experiment would be to measure rhodopsin downregulation in wild type mice under the same treatment regimen as in the rhodopsin mutant mice (not just 24 hr post treatment at a different postnatal day). How do the authors rule out the possibility that the rescue of degeneration is simply due to a non-specific delay in development and hence a delay in degeneration? Other retinal cells might not be the best control if they are not actively developing during this time window. Are there other organs/cells known to develop rapidly at the time of PR3 treatment? We also find it interesting that Photoregulin3 (PR3) treatment leads to such a large change in rod gene expression, whereas the germline deletion of Nr2e3 or the Rd7 mutation does not; however, this may be due to compensation from loss of the gene in development by other rod transcription factors, and this compensation may not occur in PR3 treated retinas or adult deletion of Nr2e3. Since we submitted our manuscript, we became aware of another study that used CRISPR-Cas9 to delete Nr2e3 in postnatal mice (Zhu et al., 2017); deletion of this gene in adult photoreceptors caused a large reduction in rod gene expression and an increase in cone gene expression, very similar to the CRISPR-Cas9 deletion of Nrl (Figure S1 of Zhu et al., 2017). Furthermore, this recent study demonstrated that deletion of Nr2e3 by CRISPR-Cas9 is protective in the Rd1 and Rd10 models of RP (Figure 1 of Zhu et al., 2017), similar to what was found with Nrl deletion and similar to the effects we observe with PR3 on RhoP23H mice. Thus, the CRISPR-Cas9 deletion of Nr2e3 shows that targeting Nr2e3 can cause a functionally relevant decrease in rod gene expression. As for whether PR3 causes a non-specific delay in development of the animal or the retina, we have not observed any change in body mass or age of eye opening in treated mice, and the other cells in the retina appear to be similar in both treated and control mice. Additionally, the RNAseq shows primarily changes in photoreceptor genes. For example, we see no change in the expression of Muller glial genes Rlbp1, Slc1a3 (Glast), or Glul. Muller glia are the last-born cells of the retina and are still maturing at this time. To further control for this possibility we tested PR3 on adult wild type retinas in explant cultures. We found that after two days there was a 60% reduction in Rhodopsin expression in the PR3 treated retinas, as compared to the DMSO control. These data are now shown in Figure 1G. For ITC, we used Nr2e3 protein purified from E. coli. Proteins purified from bacterial cultures do not have any post-translation modifications and may not be completely folded correctly, and these differences may contribute to this discrepancy. It is also possible that Nr2e3 changes conformation in the presence of co-activators or co-repressors and PR3 then has a higher affinity. In HEK 293 cells, transfected with Nr2e3, Crx and Nrl, we see effects of PR3 at 1 μM (Figure 1—figure supplement 1A-C). Additionally, the original screen used a different mammalian cell line (CHO-S) transfected with Nr2e3 and NCoR and calculated an IC50 of 0.07 μM for this compound (PubChem Assay ID 624394). We agree this is not obvious from the micrographs shown in the previous version. We see some differences in the treated retinas in regards to nuclear shape and ultrastructure, but they are not easily quantifiable, and so we have deleted this statement. "The initial screen that identified PR3 demonstrated its effects on Nr2e3 in a co-repression assay with NCoR; however, the effects we observed on rod gene expression suggested that PR3 also inhibits the co-activator function of Nr2e3. […] It is not clear why stabilizing the complex would reduce its activity; however, it may be that stabilizing interactions with Nr2e3 prevents Nrl and Crx from interacting with consensus sites on the DNA, or alternatively prevents the recruitment of other components of the transcriptional machinery." There are several issues that, if addressed, would strengthen the conclusions of the study. First, some of the experiments appear to have been performed in very few, or even a single, biological replicate. For example, the data presented in Figure 1B (the effects of PR1 and PR3 on Rho expression by qPCR) show a single biological replicate. To solidify this result, three biological replicates should be presented. Similarly, only two biological replicates are presented in Figure 1C. The reviewer is correct that the data shown in Figure 1B were from a single biological replicate and the data from Figure 1C was done in duplicate. Figure 1B is now shown as an average of 3 biological replicates, and we performed the qPCR analysis at a single dose with 3-4 biological replicates per condition and is now shown in Figure 1C. It was unclear from the text how many biological replicates were performed for the RNA-seq experiment presented in Figure 2A. At a minimum, two biological replicates are needed and three are preferred. We apologize for any confusion. The RNAseq data shown is an average of two biological replicates, and we have stated this more clearly in the text and the legend. We agree that using heterozygous mice might be more appropriate to mimic the human disease. However, the RhoP23H heterozygous mice do not show significant degeneration until postnatal day 148 (Sakami et al., 2011), which is a bit prohibitive because we need to inject PR3 daily to repress rod gene expression. In addition, we find that the pharmacokinetic properties of the compound are such that we cannot reach an effective dose in older mice by IP injections, and are limited in the number of intravitreal injections possible in mice. Nonetheless, we see our rescue in the homozygous mice as an in vivo proof-of-principle for this approach, and we are currently working on optimizing our compounds for oral bioavailability to test in the heterozygotes. We have added these images to Figure 1B. We do not see a change in the dorsal retinal (now shown in Figure 1D-E). We see a similar effect after IP injection of PR3 in wild type mice (now shown in Figure 2C-D), an increase in S Opsin+ cells in the ventral but not dorsal retina. The PR3 treated retinas do not have outer segments, and this is now shown more clearly in Figure 2E. With the current compound, PR3, we are unable to treat for 6-8 weeks due to poor PK (animals need to be dosed daily). However, Crispr-Cas9 deletion of either Nrl (Yu et al., 2017) or Nr2e3 (Zhu et al., 2017) provides protection for many weeks in several RP models. We are currently working on modifying our compounds for better bioavailability to test for long-term protection. The authors acknowledge the support of NIH R01 EY021374 (to T Reh, S Ding and K Zhang), 1PO1 GM081619-01 (T Reh) and the Allen Distinguished Investigator Award (T Reh). The authors thank members of the Reh and Berminghan-McDonogh labs for helpful critique, and Dr. John Sumida and members of Drs. Jason Smith and Wenqing Xu labs for technical assistance and advice, and Dr. Timothy Cherry for comments on the manuscript. The authors also thank Jonathan Linton from the Vision Core for assistance with ERGs. Animal experimentation: All experiments were performed in strict accordance with the protocols approved by the University of Washington Institutional animal care and use committee (IACUC). © 2017, Nakamura et al.